In early March, 2014, award-winning actress and singer Kristin Chenoweth announced publicly that she’s been suffering from asthma for more than 10 years, but wasn’t correctly diagnosed until a few years ago. In light of her diagnosis, Chenoweth has partnered with the Asthma and Allergy Foundation of America (AAFA) to raise awareness about the seriousness of asthma. With spring right around the corner, Chenoweth’s announcement is an important reminder that asthma sufferers need to arm themselves with strategies to reduce their exposure to seasonal triggers that can make their allergies and asthma symptoms worse. Minimize dust by dusting and vacuuming your home regularly. Change the air filters in your cooling and heating systems every 30 days. Avoid down bedding; use a hypoallergenic pillow and comforter instead to reduce your risk of wheezing and sneezing when you sleep. Use a humidifier every night. Clean it regularly with white vinegar to prevent the growth of mold. Wash your pillows regularly in hot water to minimize allergens and pollen build-up. Wash your hands frequently especially if you have pets. Touching your face after touching your pet may transfer pet dander onto your skin that can easily trigger symptoms when inhaled. Keep well-hydrated by drinking at least 8, eight-ounce glasses of water every day. Drinking plenty of fluids helps neutralize triggers that may have made their way into your blood stream. Steer clear of non-natural artificial sweeteners and food dyes. Although more studies are needed to confirm this link, food dyes and artificial sweeteners like aspartame have been associated with causing asthma. Be prepared; always keep your rescue inhaler nearby. You never know when you’ll come in contact with an airway irritant that will trigger your asthma symptoms. Always keep your rescue inhaler nearby so you can use it when you feel an attack coming on. Take your symptoms seriously. Many people don’t realize that asthma attacks are among the leading causes of death in this country. 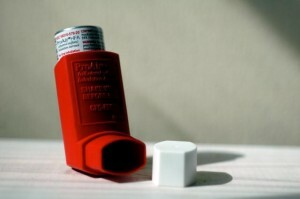 Call 911 or go to the nearest emergency room if your usual asthma treatment doesn’t relieve your symptoms. Currently, actress Kristin Chenoweth is spokesperson for Know Your Count, a national awareness campaign that aims to raise awareness about the seriousness of asthma and educate patients about the importance of keeping track of the remaining doses in their asthma inhalers. For more information about asthma or to learn more about Kristen’s story, visit the Asthma and Allergy Foundation of America.